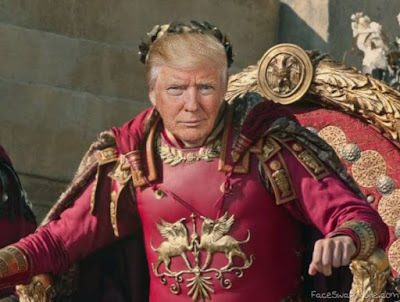 Donald Trump seems to be doing what Roman Emperors like Diocletian, Constantine, and Theodosius did long ago: splitting the empire into two halves. Trump may not have consciously decided to do that, but an Empire can only be as large as it can afford to be, and the American Empire can’t afford anymore to dominate the whole world. Flavius Theodosius Augustus “The Great” (347- 395 CE) was the last emperor to rule over the whole Roman Empire. His success was probably due in large part to his habit of plundering Pagan temples for the gold he needed to pay his troops. But Pagan temples were a limited resource and Theodosius himself seemed to understand that when, shortly before his death, he partitioned the Empire between his two sons, Arcadius and Honorius. Afterward, the empire would never be whole again. The Roman Empire had been a strong centralized power during its heydays, but it never was very interested in creating an ethnical and linguistic unity among its subjects. The Roman authorities understood very well that it was less expensive to tolerate diversity than to force uniformity — a typical policy of most empires. So, the Empire remained split into two main linguistic halves: the Latin-speaking Pars Occidentis and the Greek-speaking Pars Orientis. Theoretically, Latin was the official language of the Empire but, in practice, it remained a bilingual entity and, during the 2nd and 3rd centuries, the Roman elite would rather speak Greek — considered more refined and classy. The split of the two sides of the Empire was not just linguistic, it was economic as well. The Pars Occidentis remained based on mineral wealth which, in turn, fueled the Empire’s military power.